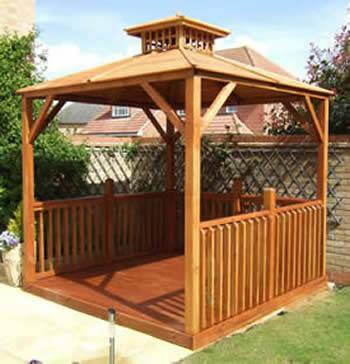 We have a selection of top quality Gazebos for you to choose from, all designed to enhance your hot tub or spa. You may wish to purchase a gazebo just to provide a covered space in your garden giving a shaded area to enjoy those summer days and relax in style. 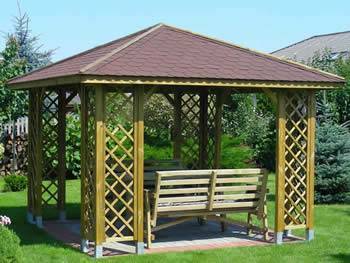 Our Regal Gazebo range offers various sizes, styles, with and with out flooring and roof shingles. 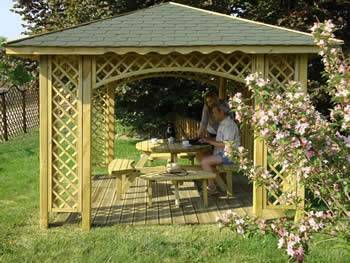 Installation is DIY but if you require your gazebo or shelter professionally installed please contact us for a quote. The delivery is a kerbside delivery at your requested address. The gazebo will arrive flat packed for home self assembly with instructions included. This will be a 2 person project and will take approximately a day to complete. Delivery on some gazebos will be 21/28 days please contact for exact delivery times.